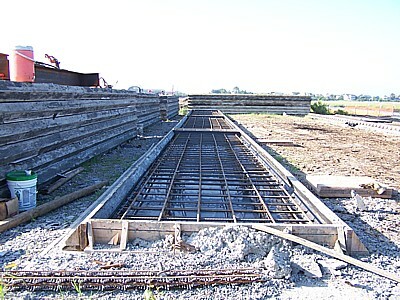 Second set of rebars covered by forms with work platform on top. Ironically a crane for maintenance work being done to the exist Sunset Beach Bridge is visible in the background. 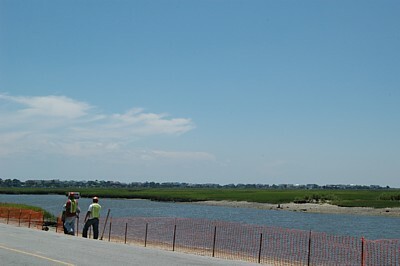 May 30, 2008: Additional work for the new bridge and its egress is taking place along side of the causeway. Large wooden forms reinforced with steel have been built. 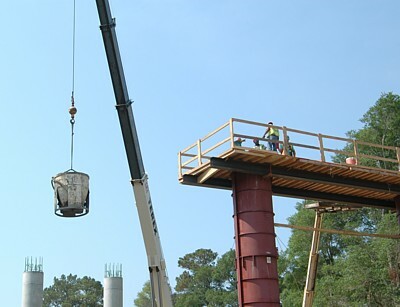 Cement trucks, unable to carry full-capacity loads because of the limitations of the pontoon bridge, amble across the bridge and down the causeway to fill the forms with concrete. After the cement hardens, each form provides a reinforced concrete deck slab or mat. 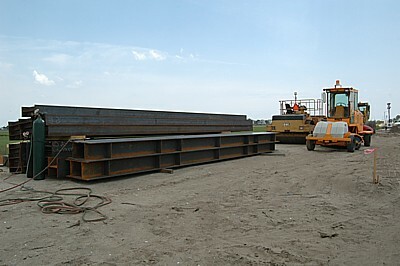 Approximately 140 slabs will be used for the causeway detour that vehicles will use during bridge construction. All together, there will be approximately 400 slabs because of widening of the causeway. A close up of one form is shown on the left. Two piles of already-made mats and a row of three work forms are in the right-hand photo. 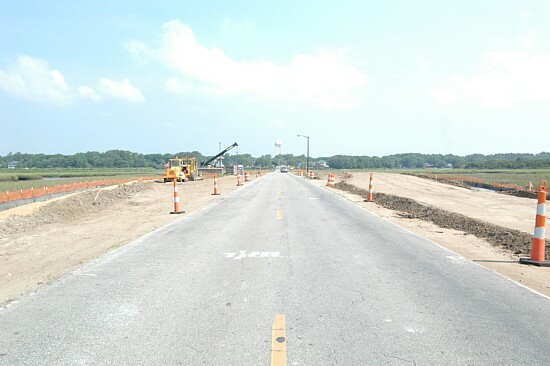 In the left-hand photo it appears that another row of work forms is being constructed. June 11, 2008: I finally "got" it. I understood what the engineers had been telling me. 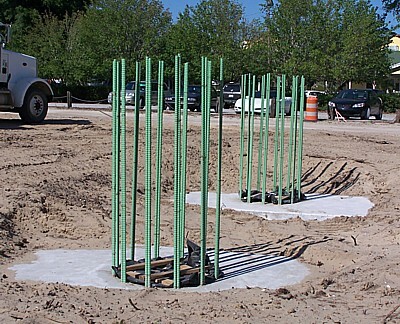 The red forms were placed around the steel green rebars. 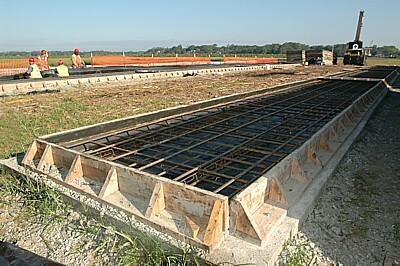 Then concrete was poured into the forms. Afterwards, the forms will be removed. 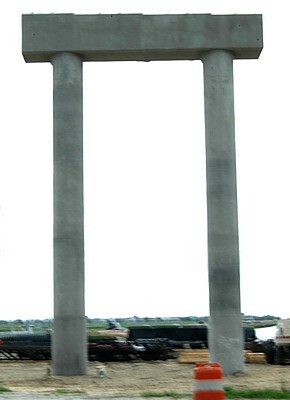 The results are concrete columns reinforced with steel. 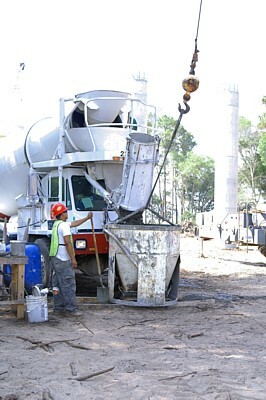 In the photo on the left, dark wet concrete is being poured into the bucket. 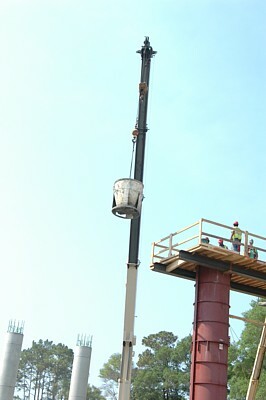 In the photo on the right, the bucket is being lifted up toward the work platform. 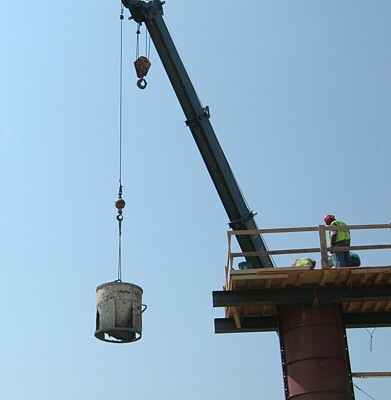 Empty bucket of concrete being lowered back down to the concrete mixer. 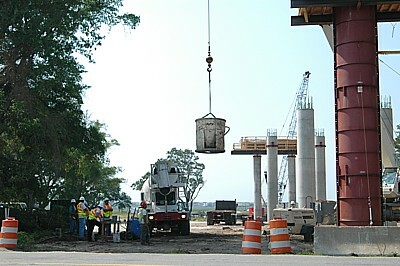 Approximately two truckloads of concrete are needed to fill each column. 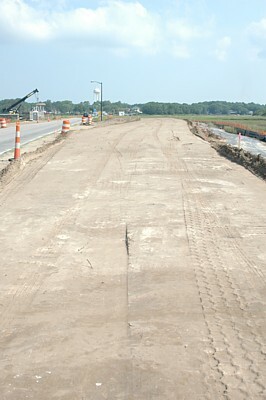 June 12, 2008: The widened causeway will extend to the brown soil on the left. Its elevation will be at the height of the top of the pile. 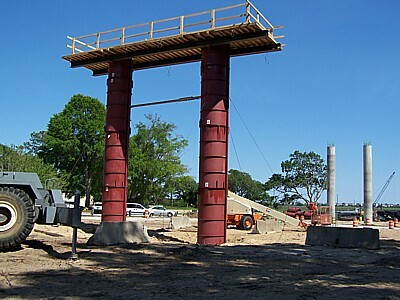 This is the foundation of a detour ramp that will be used for awhile during bridge construction and causeway modifications. 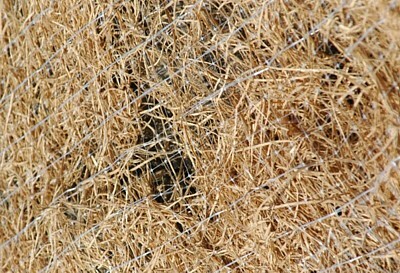 Because I am very concerned about the animals in our environment, I was pleased to learn that this matting is biodegradable. The slopes have been permanently seeded. 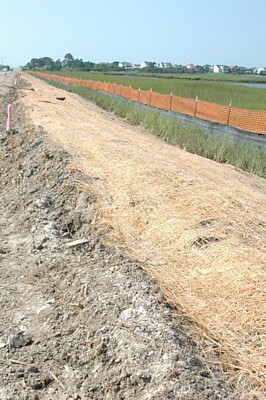 Matting was installed to prevent erosion, holding the dirt in place until grass has established itself on those slopes. 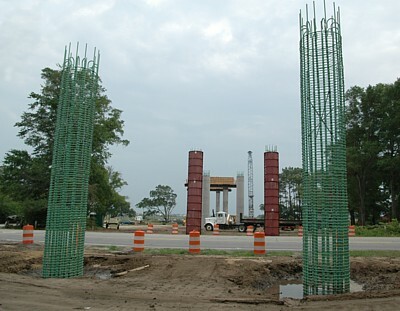 June 15, 2008: These are the first two concrete columns that were complete and on which beams were installed to support the bridge. 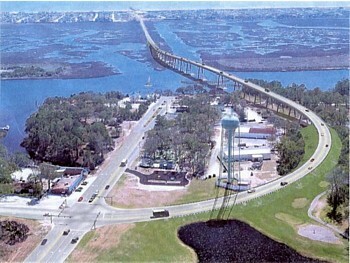 They are nearest the Intracoastal Waterway. 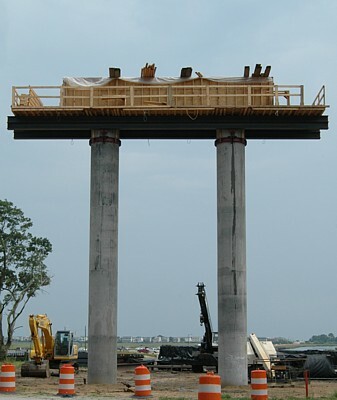 This photo shows five pairs of columns in four different stages. 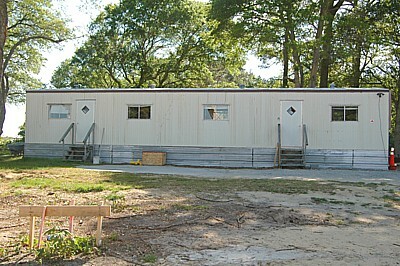 The two pairs furthest back have support beams on top. The next pair are concrete columns without support beams. 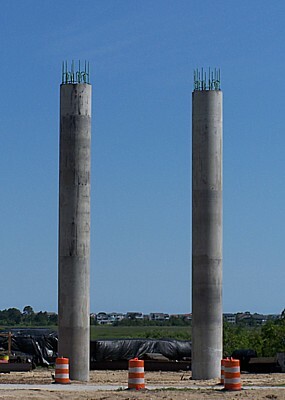 The second-closest pair, encircled by red molds, are the ones photographed (above) on June 11 into which concrete was poured. 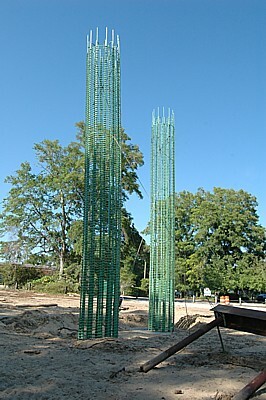 The final, green rebar pair in front, will be wrapped in molds and then filled with concrete. 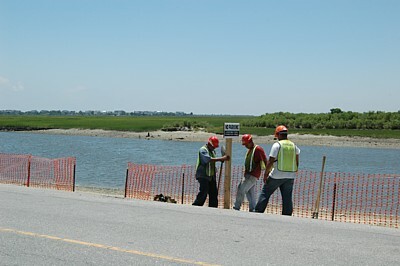 June 16, 2008: English Construction Company employees closed the boat ramp next to the bridge. Only construction vehicles may enter the area henceforth. 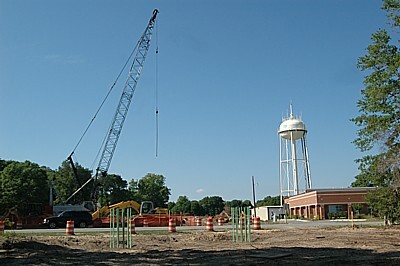 June 18, 2008: Work continues in still another area. 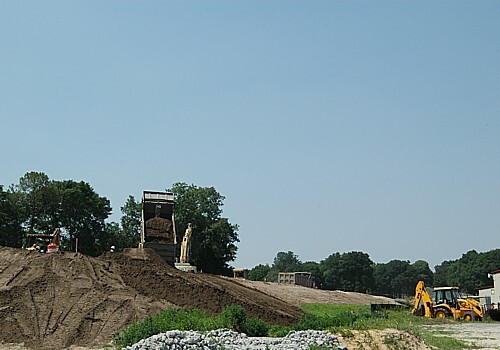 A massive pile of dirt is being hauled in and shaped to make the approach ramp to the bridge. It is near the fire station. Multiple vehicles are involved. Dump truck after dump truck delivers dirt. One is leaving in the background. 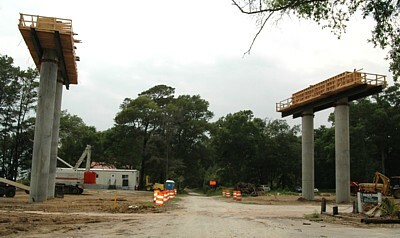 June 22, 2008: First columns with a cap. This will support the girders that will support the bridge deck. 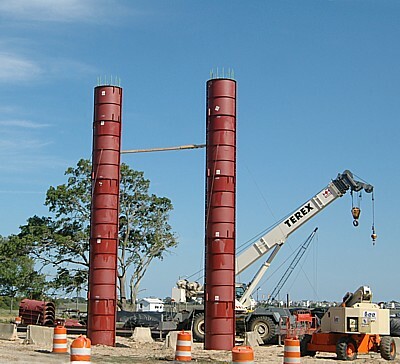 These columns are nearest the intracoastal waterway. 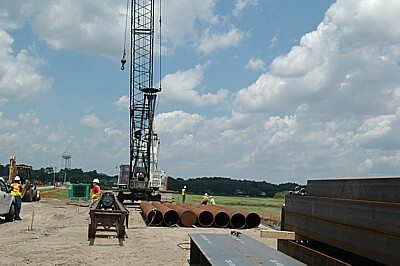 June 30, 2008: The left image shows both staff of English Construction Company and NCDOT conferring about placement of the first round beams that will support the causeway detour. 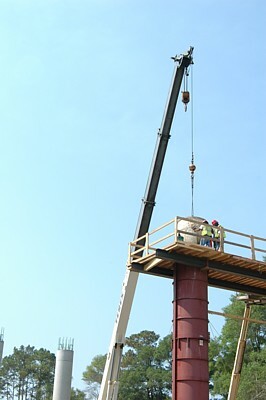 The instrument on the left pointing vertically toward you with a man leaning against it is the hammer that will be used to pound the beams into the ground, which is marsh. The terrain is sloped and leads to marsh. 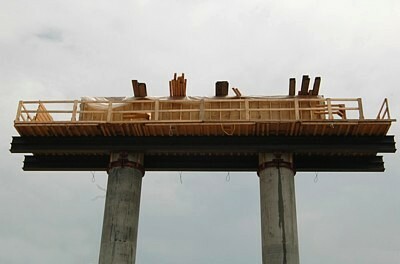 The "beams" on the right will be used under the deck slabs that will be the surface of the causeway detour. All of this equipment is on a newly filled-in ramp area for the detour.